Sherril...I love your cardigan. It's beautiful! The color is awesome and I like contrast band. Would you say the sleeve/armhole is tight or did you have to make any adjustments to the armhole or sleeve? This cardigan is also on my to do list...hopefully I'll have it done before the end of they year. lol! Susan, thank you for your comments. The sleeve/armhole isn't tight on the cardigan, but remember, I'm short and usually make a petite adjustment in the armhole. I didn't on this one and my fabric is quite stretchy so that might make a difference. I'm almost finished with it and when I'm done, I'll take some pictures and you'll see what I mean. I can't wait to see it one you. I love the red and black combination. 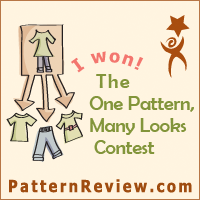 This is the second time I've seen this pattern and liked it - I might have to invest in it. ;) I think skimming looks better than tighter fitting. I know a couple of friends have told me that slightly tighter looks better, but I figure if I'm going to be self-conscious then I won't wear it. I agree with Alana.It looks good and it's a lovely color combo. I've made 2 jackets using the Cecelia Podolak book and I love both of them. Interesting comment re needing something to wear with a jacket right away - wonder if that's why I don't do jackets? Anyway, glad to see you've got your mojo back - LOVE the cardigan, red & black are so your colors - yes, you'll be a million bucks for Parents Night! Freebies, to boot! That looks great! I think the hook and eye closure will make it more interesting than your average cardi. Adding sleeve bands will be the perfect little touch. Sherrill, I have this NL pattern and I really want to know what adjustments you made to it to make it fit you since we are nearly the same size......This is a great easy piece to throw over a simple Tshirt and make an outfit look pulled together. 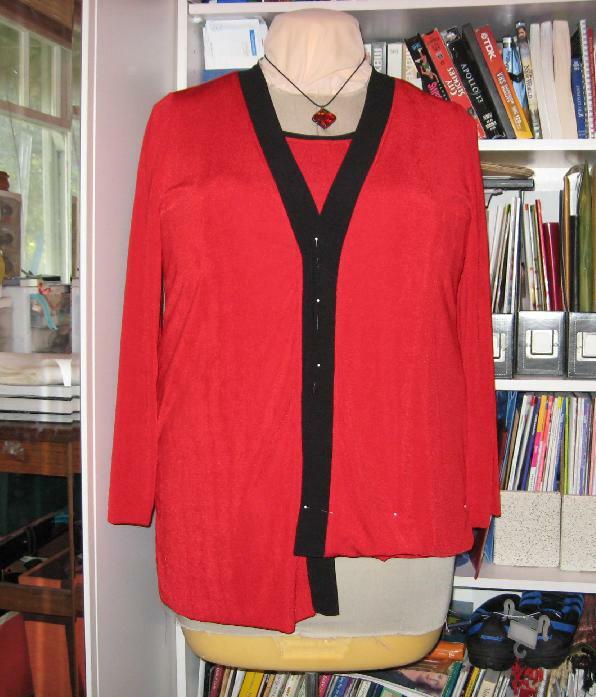 I created a similar cardigan using a plus size pattern (Simplicity, can't lay my hands on it right now) that had the butted front that you created for the NL. We must be equal but opposite, because I altered my cardigan to overlap. Wonderful save on the jacket, Sherril! How are you going to hem the jacket" Is it lined? I was just wondering about the depth of the hem. Duh, it just dawned on me that you would be taking up the hemline 3 1/2 inches higher, right? Now I get it! Oy,,,,,I think this will be very flattering and color works so well on you. Can't wait to hear all about the pants! Sherril, I'm loving the new cardigan set! The red and black look so well together. 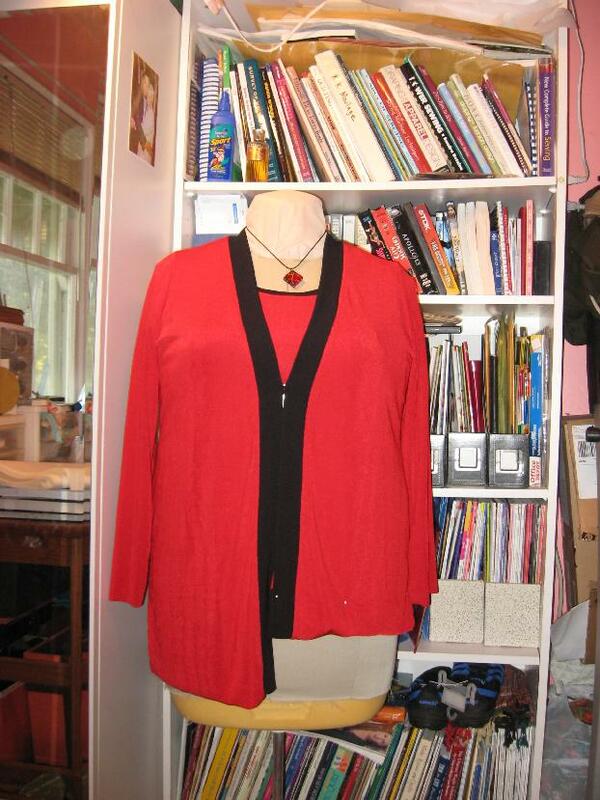 I also like the hook and eye detail and have plans of using that same detail on a cardigan. When you get the black pants made up this will be a wonderful outfit!